The Firefly systems were supplied by IPWL's distributor, Welding Company, Belgium. The following article is a detailed account of the challenges faced by this project. Adrian Blackmore, Murphy International Ltd, Ireland, outlines how early contractor involvement, collaboration and a strong focus on innovative engineering, ensured the safe and successful completion of the Corrib Gas Pipeline Project. The Corrib natural gas field was discovered in 1996 by Enterprise Oil, some 83km off the north-west coast of Ireland, 350m underwater, with the gas reservoir a further 3,000m below the seabed. The gas field was bought by Shell E&P Ireland Ltd (SEPIL) in 2002. By global standards, the Corrib gas field is a medium sized field, estimated to contain approximately two thirds of the amount of gas contained in the Kinsale Head gas field. It will supply up to 60% of Ireland's gas needs during peak supply and is estimated to have a field life of between 15 and 20 years. Corrib gas is being developed using subsea technology tied back to an onshore gas terminal in Bellanboy, Co Mayo. 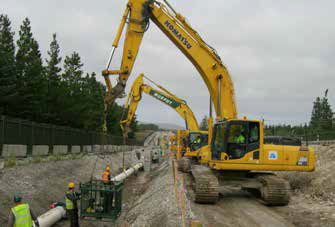 As a result, the Corrib Gas Pipeline Project would be one of the most significant engineering projects ever undertaken in Ireland, and Murphy International (Murphy), a subsidiary of J. Murphy & Sons Limited, was awarded the final phase of its construction - the laying of the onshore pipeline from the landfall site at Glengad to the Bellanboy Bridge Gas Terminal. The onshore pipeline is 8.3km long, with 4.9km of this being laid in a 3.5m ID tunnel running at a depth ranging from 5.5 -12m under Sruwaddacon Bay in north-west Mayo. The tunnel is the longest in Ireland, making the gas pipeline the longest gas pipeline tunnel in Europe. The works were awarded in two stages - the first in January 2013 for the 3.2km land section from Aghoose to Bellanboy in collaboration with Roadbridge, who prepared the spread, backfilled and reinstated it. The second phase involved the installation of a 500mm dia. 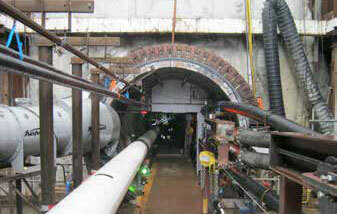 Gas pipeline in the tunnel. Murphy was employed as the specialist pipeline contractor to weld, NDT and ditch the 310 weld pipeline in single pipe lengths in a trench wide enough to fit a side boom. The first five months of the project, which was scheduled to be completed at the end of October 2013, were spent developing the weld procedures and gaining approval. The 500mm dia, pipe had a 27.1mm wall thickness and was specified for offshore use. The contractual requirement was to use an automated welding process together with an automated UT process that would give the client total guarantee of quality. Murphy, with considerable research and development done by its welding engineers, used its Scorpion automated welding equipment to develop a system and set of welding procedures that could work consistently in the field. The approval process was both exhaustive and rigorous and co-ordination exercise in itself to marry the requirements of numerous specifications, approval agencies and designers into one approval regime. Commenting, the SEPIL Welding Engineer said: "SEPIL sought to uniquely apply a set of offshore mechanised welding acceptance criteria to an onshore pipeline, a weld engineering process that had never been attempted prior to Corrib." 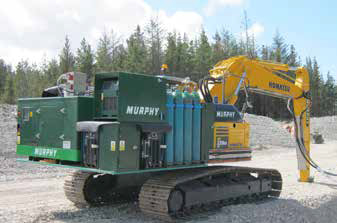 Murphy subcontracted the specialist AUT operations to Shaw Pipeline Services, who was responsible for the offshore pipeline AUT works. Prior to works commencing onsite, Murphy had to overcome a number of separate challenges that the site conditions presented. The first of these was to provide a welding habitat that could fit over the pipe, be transportable, and also protect the welding process from the extremes of north-west Mayo weather. 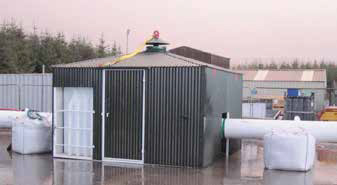 Murphy International developed a lightweight aluminium shelter made from chequer plate shaped for placement over the pipe that was self-contained to support the Scorpion welding equipment. This was designed to be lifted into position using either a crane or backhoe. The second challenge was to develop a set of plant and equipment specifically for use on a narrow spread where weight and mobility were important considerations. The normal pipeline plant for handling pipe and equipment - side booms and cranes - were unsuitable for the geography and condition of the spread. There were several pinch points along the route where the spread was less than 8m wide so it was essential to have plant that could travel through these sections and function without disruption to welding production. The team engineered an option whereby all the welding plant and power packs were mounted on the back of zero-slew 20t rated backhoes. The counter-balance weights were removed from the machines and platforms welded in place to mount the generators, gases and welding equipment. The backhoe was also used to lift and transport the welding habitat along the spread. Murphy developed two of these backhoes and put them out in the field in mid May 2013 for trials. Production welding eventually in late June, with one crew averaging one to two butts a day depending on circumstances. The second crew joined the spread a month later following bend prepping works at the Murphy offsite fabrication facility in Newbridge. By this time, many of the expected start-up problems had been overcome and production increased considerably. Murphy International further increased the welding resources during September with conventional 4WD welding rigs to boost production and achieve SEIPL's milestone date of completion by 30 October 2013. The second stage, negotiated with the tunnelling contractor BAM/Wayss Freytag Joint Venture (BW JV), was tendered in May 2013 and following an international competition, was provisionally awarded to Murphy In November 2013 under a letter of intent. The award was for the installation of the 500mm dia. gas pipeline, together with a number of service and umbilical control lines through the pits to the tie-in locations. Murphy undertook the design of the pipeline installation and services within the tunnel and landing areas, employing the specialist design services of J. Murphy & Son's Limited specialist design subsidiary Protech to approve the pipeline support and restraint systems. The pipeline designed to operate at approximate MAOP of 100 bar and a test pressure in excess of 500 bar had to be designed for this. All pipelines, services and umbilical lines had to be supported in the tunnel and some 10000 brackets were required to achieve this. These were designed by Murphy International and manufactured locally ahead of the tunnel being made available by BW JV. In the five month lead up to the tunnel handover by BAM, Murphy had a number of challenges to surmount. The first of these was the tweaks required to the welding process to make it more suited to welding strings in the pipe yard. Again, it was required to weld using an automated welding process and AUT. Murphy decided to use the Firefly bug system over the Scorpion bugs as they were more stable and consistent in a pipe yard environment. Shaw Pipeline Services was appointed again as an AUT subcontractor. From lessons learnt on the previous model, Murphy decided to further develop the welder's habitat to make it considerably larger to accommodate welders, mates and inspectors in one go. Ventilation was also improved in the habitat. From the outset, the main challenge was how to install the gas pipe, water pipes, grout pipes, umbilicals, fibre optic and signal cables and ventilation ducting into the tunnel in a set sequence to satisfy the planning layout requirements. 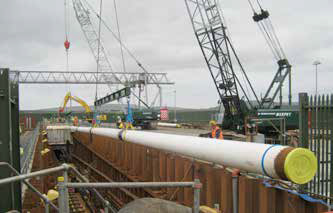 Extensive early engineering and design work was required by the Murphy team to propose, test and approve the various systems required to install the pipework. This process took four months to gain all approvals and involved the construction of a life-sized tunnel mock-up to prove the installation methodology. In the final scheme, the tunnel locos were utilised to pull a working platform mounted on tunnel bogeys up and back though the tunnel. The working platform was 72m long and on it were mounted bespoke designed and engineered work stations providing welfare, lifting, welding, NDT and coating operations as well as transport for the tunnel crews. All of this was designed from first principles and manufactured in Murphy's Newbridge workshop. 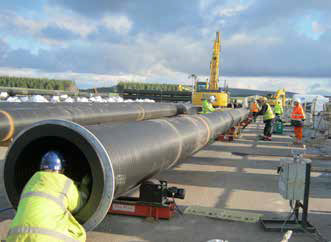 The designed and approved installation method of the main pipelines involved welding them into 72m long strings and stockpiling them in the yard in Aghoose before delivery and lifting onto the delivery platforms in the drive pit and subsequent travel and installation into the tunnel. The compound in Aghoose was designed and constructed to minimise environmental impacts particularly as the site stood in a dedicated conservation area - a candidate special area of conservation (SAC) and proposed special protection area (SPA). BW JV handed over possession of the tunnel in mid June 2014 From then on, Murphy International worked a 24/7 three-shift system for nearly five months to install the series of support brackets, pipelines and umbilical lines to complete the tunnel section works. The prefabricated strings of pipe were transported from the pipe yard to the Aghoose Drive Pit by four backhoe excavators working in tandem and lowered down on to the working platform before being pulled up the tunnel by the locos. Inside the tunnel, the pipe was lined up and levered into position using the mechanical arms on the loading platform, put to the clamp and welded, NTD'd and wrapped before the next string was bought up the tunnel. At peak times, Murphy installed four stings in a 24 hour day with six welders. Safety was the primary driver on this project, and Murphy shared a common objective with SEPIL during the construction of the pipeline to promote a strong culture of behavioural and attitudinal safety with everyone feeling responsible for their own safety and the safety of their co-workers. With the participation and support of all employees, Murphy introduced and implemented a number of safety initiatives, including detailed site environmental safety inductions for new employees, management HSQE inspections and weekly meetings, method statements for all work activities, detailed lift plans, work permits, toolbox talks, pre-task talks and lifesaving rules. A safety stand down was also held once a week and after all bank holidays, and safety observations and conversation cards were also introduced. 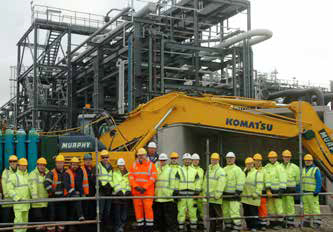 As a result, Murphy achieved the milestone of 200,000 man hours worked without an accident. Murphy completed the tunnel installation works exactly two months ahead of schedule in early November 2014. The tunnel was handed back to BAM on 7 November 2014 and all as-built documentation and records were completed and submitted a few days later. The hydro-testing of the pipeline was carried out by others before Murphy completed the final golden weld at the LVI in Glengad on 15 December. The project was considered a success on all levels by all parties, with the main factors for this being the effective planning, good communication and key people involvement throughout the project. Early involvement by all concerned parties through meetings and workshops ensured that a robust design for the installation process was agreed. This enabled a smooth installation when works started onsite. Regular site meetings with all concerned parties led to early intervention and the efficient and effective resolution of all challenges which the project faced. Finally, Murphy International allocated key people dedicated to the adherence and attention to detail the project demanded, to ensure all the design, planning, safety, quality and environmental challenges were met within the budget forecasts, throughout the duration of the contract ensuring no surprises. A delighted Corrib Project Director for SEIPL, Roeland Borsboom stated: "At every stage, the team adopted measures to minimise risks as well as construction and environmental impacts on the local community". The bulk of the gas produced from the Corrib field will be supplied to the national grid via the finished 149km pipeline from the gas terminal in Bellanboy Bridge Gas Terminal for processing in Mayo to Ballymoneen outside of Galway. Figure 1. 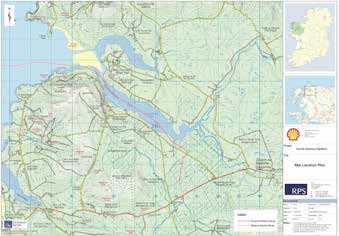 Corrib onshore pipeline route. Figure 2. Assembling vent pipe strings in the yard. Figure 3. Gas pipe lowered into pit. Figure 4. Gas pipe entering tunnel. Figure 5. Welding on spread. Figure 6. Improved welders habitat. Figure 7. Weld equipment mounted on backhoe.